Why 2019 Is the Year to Be Yourself — Brooke Ellen, Inc.
My family was sitting around the family room during Christmas in an unintentional circle and sharing what our highs and lows were for 2018. My high felt easy—the way I love my little (not so new anymore) guy is the sweetest surprise. My low felt understandable—it’s been a fluff year, a year of transition and blur. And for someone who really likes intentionality and feeling like I did my part/job, I was relieved to realize that all that feels okay. I had a baby this year—everything else was a bonus. But that conversation also led us to talk about our hopes and expectations for 2019. Now, before I go any further, let’s commit to not getting distracted or overly focused on labeling. You do you when it comes to naming your goals/hopes/expectations/resolutions/intentions/prayers/whatever for 2019. I don’t care what you call them, but what I do care about is inviting you into owning what they are and who you are this year. Since 2019 marks a new decade for me, I’ve been doing even more reflection than normal (which is honestly a lot already). I’ve been all about the Enneagram (like pretty much everyone else this year), and I’ve noticed more and more my trends towards extremes—hello, one-like qualities. I can swing from one extreme to another as I try to understand what’s true and how to navigate through life and relationships. The image I have for 2019 is one of a pendulum evening out and getting closer to its center. That’s me. I want to get closer to my center this year. I want to settle in to who I am and who I was created to be. It’s about embracing my reality and flicking off the BS, the fake, the worry, and the fear that’s been stuck on me for decades. It may have served me in the past, but 2018 showed me that it ain’t serving me anymore. This year I’m going to settle in to my . . . Your version of embracing who you are this year and what you want will look decidedly different than mine, but I am asking that you’d consider how you can say yes to yourself more this year and ignore the “shoulds” that take up too much damn space. We don’t have time for that, friend. It’s time to get cozy with ourselves—owning and embracing our reality and core. It’s time to really settle in. Click here to snag one for yourself! 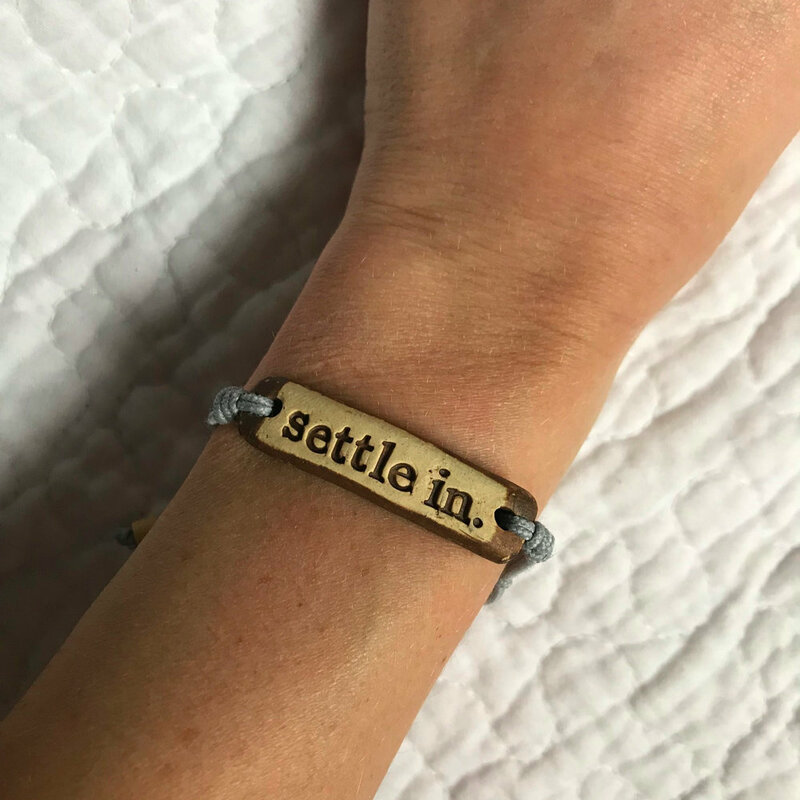 I teamed up with MudLOVE, which is a handcrafted pottery shop that offers fully customizable bands, to make ensure that I’d have a visual reminder of my intention for the year. The best part about the band is that each purchase provides a week of clean drinking water to those in the Central African Republic through Water for Good—this is a solid win-win.